Our PayConcierge solution is optimized for customers who wish to simply make a quick payment without registration or setup of recurring payments. Your customers can utilize the enrolled website to receive notifications via email and SMS, view exact replicas of their paper bills, store bill images and create a digital wallet for ACH and credit card. The one-time payment option provides customers with the ability make a single payment from a secure, web‐based customer‐facing solution; branded to match the look and feel of the biller for both ACH and Credit Card payments. 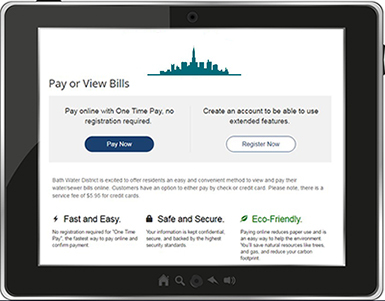 The one-time payment option can ease tentative customers into the process of paying their bills electronically without requiring them to enroll in the recurring bill-pay option. For over 28 years we have provided payment processing solutions driven by the need to raise consumer engagement, increase adoption and lessen the cost of payment acceptance to keep pace with today’s emerging payment technologies. © Automated Merchant Systems, Inc. 2019 All rights reserved.